Filipino boxing legend Manny Pacquiao 60-7-2 (39) wants three more fights before hanging up the gloves at the end of 2019. The 39-year-old General Santos southpaw has been plotting the final phase of his career after his seven round drubbing of WBA welterweight champion Lucas Matthysse 39-5 (36) of Argentina in Kuala Lumpur, Malaysia last month. Last week Pacquiao met with his former promoter Bob Arum of Top Rank to discuss potential options. It is understood that Arum offered to make fights with undefeated welterweight Terence “Bud” Crawford 33-0 (24) and lightweight phenom Vasyl “Hi-Tech” Lomachenko 11-1 (9). In an ideal world, Pacquiao wants to return to the ring in December before fighting twice more in 2019. “We know what he wants,” said Arum, 86, to the Manila Bulletin as he waited to board the Philippine Airlines flight back to Los Angeles. 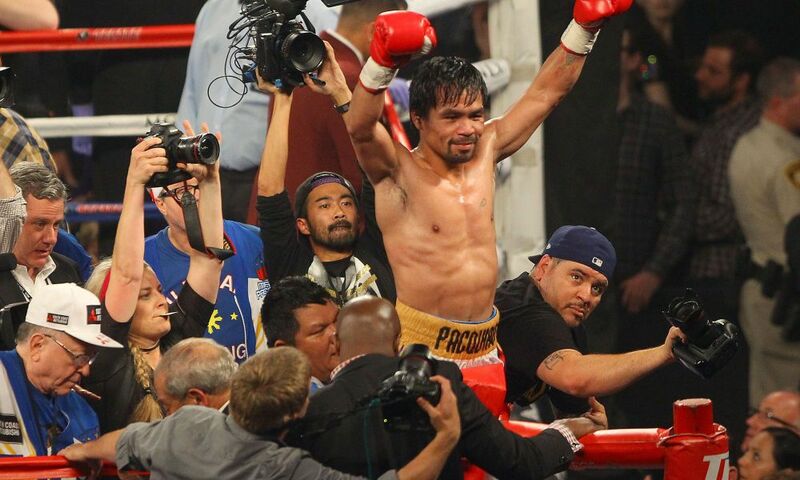 No decision has been made on who Pacquiao is likely to face if the December fight goes ahead. “Still up in the air,” said Arum. The Las Vegas-based promoter made the whirlwind trip to the Philippines with his stepson and Top Rank president Todd Duboef after it was revealed last week that rival promoter Eddie Hearn of Matchroom Boxing was in discussions with Team Pacquiao about signing up as part of the British promoter’s US expansion. While Arum has been dangling potential fights with Crawford and Lomachenko – two of the top three pound-for-pound boxers in the world – Hearn has offered up Pacquiao’s former sparring partner Amir Khan 32-4 (20) who has long been seeking a fight with the former eight-division champion. Top Rank has an exclusive deal with to provide content to streaming service ESPN+ while Matchroom Boxing recently signed an eight-year, $1 billion deal with rival streaming service DAZN that will see 16 US fight cards broadcast on the service along with a further 16 cards from the UK.